It’s not too often I find myself branching out and playing many new games. 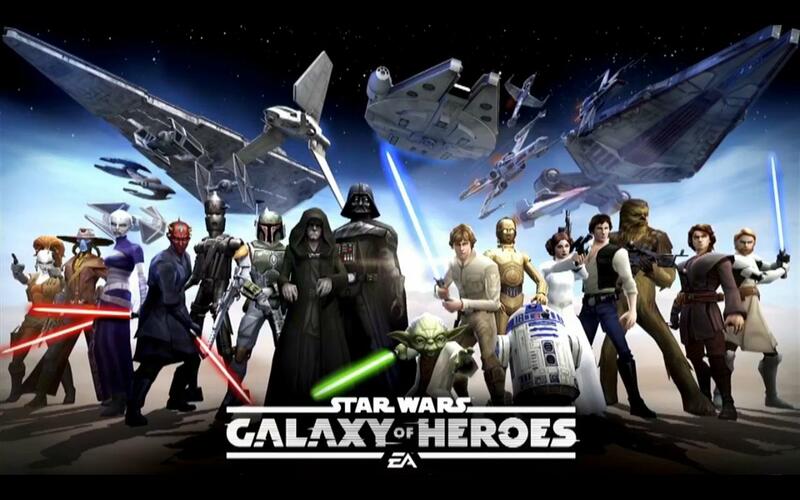 I don’t know what it was that caught my eye this time but I decided to give Star Wars: Galaxy of Heroes a try and see if I liked it. Long story short? I LOVE IT!!! Initially you start out with one or two light side characters and a fairly decent, if wordy, tutorial. You slowly unlock some low level characters and are introduced to various aspects of the game. As you progress you are given additional types of currency and unlock new types of game play. If you want to speed up the process there are a TON of in-app purchases to help you along. The basic concept is that you take your team of characters, generally either light or dark side, and fight against a team of characters on the opposite side. As you progress you unlock additional battle types with variations on the general concept of taking a team of Star Wars characters and fighting other characters. The rewards you gain for beating a level can be used to level up and upgrade your characters to unlock new abilities and powers. So far I have unlocked both the light side and dark side battles, Squad Arena, Squad Cantina Battles and Challenges. Each area comes with unique rewards and most have their own accompanying store with items that can only be purchased there using the currency that is only available as a reward in that battle type. I can see three more areas with a taunting lock image over them waiting for me to get far enough along to unlock them as well! Normally I hate the games that have limited resources and require you to wait for an extended amount of time before accruing enough resources to go back and play again. Where there are so many different areas to play in with their own unique resources I haven’t had any issue not being able to play when I want to be able to. In fact the resource limits have actually proven to be a good thing as they have kept me from playing for the hours and hours that I want to play and ensure I don’t get in trouble with my wife for wasting too much time. Galaxy of Heroes quickly sucked me in with my team consisting of a Jedi Consular, Clone Wars Chewbacca, Clone Sergeant, Ahsoka Tano and a Jawa. I quickly went from a level one player to a level 25 or so (I’m 33 now!). I’ve unlocked several characters on both the light side and dark side of the force and have been able to do it without spending any real money. The game has a lot of pluses and I have enjoyed myself quite a bit! That all being said, I am in need of allies so if you want to give the game a try and add me I won’t say no as long as I have available ally slots. My Ally Code is 757-355-935, send me an invite! Download the game from the Google Play Store and check out the trailer below while you’re at it. Microsoft Apps – An app to find apps?